Probably the most dangerous thing about Nigel Farage and UKIP is that they are essentially right about one thing, that the EU is an anti-democratic organisation. The fact that they are right about the anti-democratic nature of the EU allows them to hide a load of extreme-right "Thatcherism on steroids" policies behind their stated opposition to the EU. It is worth noting that UKIP certainly don't oppose the £millions in EU salaries and expenses they claim, despite having the worst attendance and voting record of any party in the entire EU. So even if you're not disinclined to mistrust their extreme-right policies or their rogue's gallery of ex-Tory party donors and failed Tory politicians, their complete hypocrisy in riding the EU gravy train should be enough to make you mistrust them. There have been countless demonstrations that UKIP are right, and that the EU has no respect for democracy, especially their absurd decision to make Ireland go back and hold their referendum on the Lisbon Treaty again, until they got the right result. The latest display of outright contempt for democracy by the EU is their decision to block a Citizen's Initiative against the so-called Transatlantic Trade and Investment Partnership (TTIP) because they do not want to allow the citizens of Europe any kind of avenue to prevent this massive corporate power grab from going ahead. I'm not going to go into a huge amount of detail about why the TTIP is so bad because there's far more criticism than could possibly be covered in a single blog post. Lowering of standards: If TTIP is signed, it will mean that legislation will be harmonised by lowering standards. Where Europe may have higher environmental standards, they will be lowered to weaker US standards. Where the US may have higher food safety standards, they will be lowered to weaker European levels. Standards won't be harmonised by bringing them up to the higher level, they will be harmonised by bringing them down to the lowest common denominator. Job losses: TTIP could end up costing tens of thousands of jobs, just like countless other so-called free-trade deals before it. If the impact is anything like the impact of the NAFTA free-trade deal, it could even cost hundreds of thousands of jobs over the course of decades. Before these deals are signed, positive projections of the economic benefits are touted about by supporters of the deal, but in retrospect, the projections have often been proven to be wildly over-optimistic, and the economic downsides much worse than predicted (if they were even mentioned by supporters of the deal at all). Destruction of public services: One of the objectives of TTIP is to open up European public services for privatisation. The French have successfully exempted "cultural industries" (such as the French film industry) from TTIP, but the UK government has flatly refused to seek a similar exemption for the National Health Service, an understandable decision by the Tories, given their desire to see the NHS carved up and given away to the private sector as rapidly as possible. Undermining democracy and the rule of law: One of the most controversial parts of TTIP is the inclusion of Investor State Dispute Settlements (ISDS). These ISDS provisions are designed to make corporate activities immune to democracy and the rule of law by introducing a new level of secretive tribunal where corporations can completely bypass the legal system in order to sue governments for daring to introduce new laws that may affect their profit margins. Thus the profits of corporations become elevated above the democratic process, and above the rule of law. Secretive and non-transparent negotiations: Even before the EU decided to block the Citizens Initiative against TTIP, negotiations were being carried out in a highly secretive and non-transparent manner. Despite claims from the EU that TTIP is being negotiated in a transparent manner, the chief EU negotiator on the deal has already stated in a letter to his US counterpart that public access to all documents relating to the negotiation and implementation of TTIP will be blocked for up to 30 years. If you would like more details on TTIP please follow this link to check out John Hilary's comprehensive critique. What is a Citizen's Initiative? European Citizen's Initiatives are probably the only decent bit of participatory democracy in the whole EU political system. If one million people (from several different EU states), support a Citizen's Initiative, a legislative proposal can be tabled in the European Parliament. Ongoing European Citizen's Initiatives include movements in support of Universal Basic Income, the human right to water and the introduction of traffic calming measures in European towns and cities. Through the summer of 2014 a number of organisations and individuals opposed to TTIP (and another similar deal between the EU and Canada called CETA) begun the process of starting a European Citizen's Initiative, with the planned launch in September 2014. After the organisers had gathered the support of over 230 organisations across Europe, and the backing of the Green/EFA group in the European Parliament, the EU simply turned down the initiative before it could even get started. The French Green MEP Yannick Jadot described the EU decision to block the Citizen's Initiative against TTIP as "above all a political decision" and a demonstration of "contempt" for the tens of thousands of people to have spoken out against TTIP already. The mainstream media in the UK completely failed to cover the EU decision to block the Citizen's Initiative against TTIP. 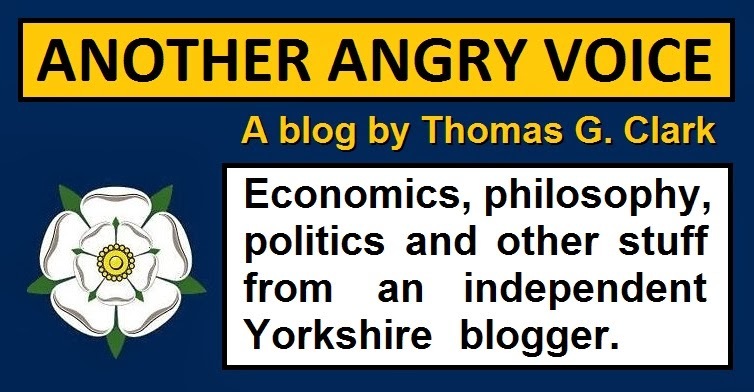 The only articles about the decision to appear were on independent blogs like my own, small independent websites, activist sites, Green party webpages and a single article on politics.co.uk. This mainstream news blackout might seem surprising given that the majority of the right-wing dominated UK media peddle a staunchly Eurosceptic line. A decision to block a Citizen's Initiative would seem like the perfect kind of ammunition for journalists who generally describe the EU in terms of being an anti-democratic monstrosity. One would have thought that this decision to obstruct participatory democracy would have made great ammunition for UKIP too, but as has always been the case, the UKIP leadership has remained absolutely silent about their position on TTIP. Probably the most likely explanation for this blanket refusal to criticise this obstruction of democracy by the EU, is that UKIP and the right-wing media are all in favour of a gigantic corporate power grab designed to make the pursuit of corporate profits supersede democracy and the rule of law. When it comes to the minority of traditionally centre-left newspapers (like the Guardian and the Independent) perhaps the explanation for their lack of coverage is that the EU decision to torpedo the Citizen's Initiative against TTIP came on a Friday, and that they're so short staffed that they couldn't find anyone to write even a few short paragraphs about it over the weekend? If this is the case, perhaps they'll get around to informing the public sometime next week? In my view, the EU decision to block the Citizen's Initiative against TTIP, is not only a display of outright contempt the concept of participatory democracy and for the citizens of Europe, it is a demonstration that they are desperately afraid of democracy, and of allowing the people of Europe to participate in politics. They are afraid that if they allow the people of Europe to participate in the political process, it may prevent them from doing whatever the hell they want to do. The EU will continue with their secretive non-transparent TTIP negotiations, but the fight against TTIP will not be stopped just because the EU decided to obstruct the Citizen's Initiative against TTIP. In my view, one of the most important things about the fight against TTIP is the provision of information. By continually treating TTIP as if it were just some kind of benign "trade deal" rather than an outrageous corporate power grab, the majority of the mainstream media have already shown that they are failing in their duty to keep the public informed. 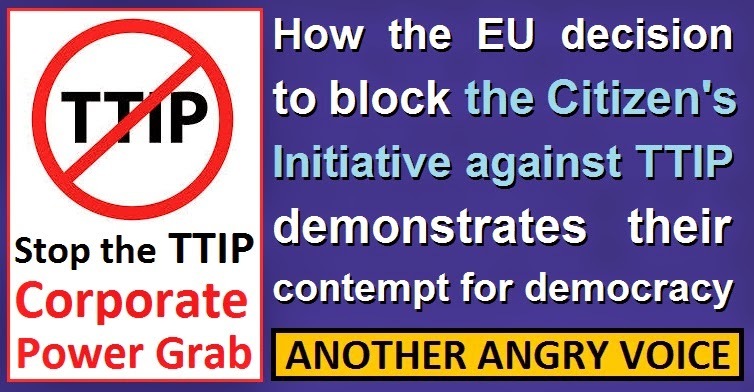 The complete mainstream media blackout on the EU decision to block the Citizen's Initiative against TTIP just goes to show how unfit for purpose they are. This mainstream news blackout should be a sign to anyone keen to keep themselves abreast of what is going on in the world, that they really must look beyond what the mainstream press is prepared to tell them if they want anything resembling a complete picture. If people are going to be mobilised in sufficient numbers against TTIP, the most important thing is that as many people as possible in Europe actually know what TTIP is, and it is absolutely clear that the mainstream media is completely unfit for purpose in this regard. That means it's down to people like me and you to spread the word. IMPORTANT UPDATE: The organisers of the Citizens' Initiative against TTIP didn't just give up at this obstructionism from the EU, they've self-organised a Citizens' Initiative against TTIP. You can sign that here. Why don't UKIP oppose TTIP? Ukippers say the funniest things! Scottish independence and the "switcheroo"